Alzheimer’s disease or dementia can impose a significant burden on family and other informal caregivers. This study investigated how the inclusion of family/informal caregiver spillover effects in a cost-utility analysis may influence the reported value of Alzheimer’s disease/dementia interventions. We used PubMed to identify Alzheimer’s disease or dementia cost-utility analyses published from 1 January, 2000 to 31 March, 2018. We reviewed and abstracted information from each study using a two-reader consensus process. We investigated the frequency and methods in which family/caregiver spillover costs and health effects were incorporated into cost-utility analyses, and examined how their inclusion may influence the reported incremental cost-effectiveness ratios. Of 63 Alzheimer’s disease/dementia cost-utility analyses meeting inclusion criteria, 44 (70%) considered at least some family/caregiver spillover costs or health effects. Thirty-two studies incorporated spillover costs only, two incorporated spillover health effects only, and ten incorporated both. The most common approach for accounting for spillover was adding informal caregiving time costs to patient costs (n = 36) and adding informal caregiver quality-adjusted life-years to patient values (n = 7). In a subset of 33 incremental cost-effectiveness ratio pairs from 19 studies, incorporating spillover outcomes made incremental cost-effectiveness ratios more favorable (n = 15; 45%) or kept the intervention cost saving (n = 13; 39%) in most cases. 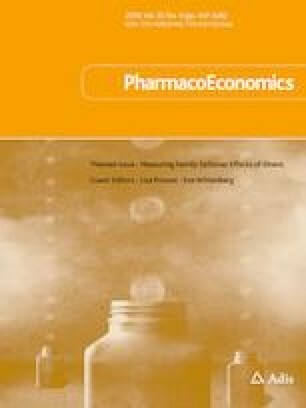 In fewer cases, including spillover increased incremental cost-effectiveness ratios (n = 2; 6%), kept the intervention dominated [more costs/less quality-adjusted life-years] (n = 2; 6%), or changed incremental cost-effectiveness ratio from dominated to less cost/less quality-adjusted life-years (n = 1; 3%). In 11 cases (33%), adding spillover effects into analyses resulted in a lower incremental cost-effectiveness ratio that crossed a common cost-effectiveness threshold, which could have downstream implications for programs or policies that are adopted based on cost-effectiveness analysis results. Most Alzheimer’s disease/dementia cost-utility analyses incorporated spillover costs, often as caregiver time costs, but considered spillover health impacts less often. In about 85% of the analyses, including Alzheimer’s disease/dementia spillover cost or health effects decreased incremental cost-effectiveness ratios or kept the intervention cost saving. The broader value of an Alzheimer’s disease/dementia intervention to society may in some cases be underestimated without considering these spillover effects on family and informal caregivers. The online version of this article ( https://doi.org/10.1007/s40273-019-00788-3) contains supplementary material, which is available to authorized users. There is an increasing recognition of spillover effects related to informal caregiving in more recent studies that evaluate the cost effectiveness of Alzheimer’s disease (AD)/dementia interventions. Most AD/dementia cost-utility analyses incorporate spillover costs, usually as caregiver time costs, but consider spillover health impacts less often. Incorporating AD/dementia family spillover costs and health effects into cost-utility analyses most often leads to more favorable cost-effectiveness ratios or keeps the intervention cost saving, compared to when spillover is not included. For many patients with Alzheimer’s disease (AD) or dementia, the majority of care is delivered by their spouses, adult children, and other informal care providers [1, 2, 3]. Dementia and specifically AD, which accounts for 60–80% of dementia cases , can impose a significant financial, physical, and emotional toll on informal caregivers. In 2016, informal caregivers of people with AD/dementia provided an estimated 18 billion hours of unpaid assistance in USA, valued at US$230 billion . Caring for people with AD/dementia often involves a wide variety of tasks, ranging from personal care to home help to medication management. Approximately, one in five informal caregivers of someone with AD/dementia have difficulty with medical/nursing tasks, compared to one in ten non-dementia caregivers, and are more likely to report a high degree of physical and emotional strain owing to their caregiving tasks . Family caregivers of people with AD/dementia are more likely than non-dementia caregivers to help with patients’ emotional or mental health problems and challenging behavioral issues . As a result, AD/dementia caregivers may have an increased risk of anxiety, depression, and sleep disorders [3, 7, 8, 9, 10, 11, 12]. Alzheimer’s disease/dementia caregivers also may experience economic hardship as a result of lost work and care expenses and adverse health consequences (e.g., anxiety, depression, and disrupted sleep) [3, 7, 8, 9, 10, 11, 12]. For example, national survey data indicated that employed AD/dementia caregivers were more likely to need to go in late or leave early, reduce their work hours because of care responsibilities, or give up working entirely, compared with non-dementia caregivers . These complex caregiving situations may result in substantial cost and health “spillover effects” on family members and other informal caregivers. Appropriate disease management can improve health-related quality of life and maximize function in the daily activities of AD/dementia patients, which may in turn alleviate caregiver burden . Failing to incorporate family/caregiver spillover outcomes in economic evaluations may underestimate the value of a healthcare intervention that may have broader benefits to society [13, 14, 15, 16], especially in diseases associated with considerable caregiver burden, such as AD/dementia. Experts in the field, including the Second US Panel on Cost-Effectiveness in Health and Medicine [17, 18], have recommended that economic evaluations incorporate the full costs and benefits of healthcare interventions. Studies conducted from a societal perspective should incorporate all costs and health effects regardless of who incurs them, and regardless of whether the costs and health effects are within or outside of the health sector. In practice, cost-effectiveness studies across all diseases typically focus on outcomes of the patient alone because broader impacts related to caregiver burden can be challenging to measure and incorporate into analyses, and therefore are often omitted [14, 15]. Krol and colleagues reviewed 25 AD cost-utility analyses (CUAs) published in 2008–13 . Cost-utility analyses are cost-effectiveness analyses that quantify health benefits in terms of quality-adjusted life-years (QALYs), which combine length of life and quality of life into a single metric . Krol et al. found that 16 AD studies (64%) included some costs or health effects of informal caregiving, a higher proportion than studies in rheumatoid arthritis (14%), Parkinson’s disease, (13%) and metastatic colorectal cancer (0%) . However, it remains unclear how often the inclusion of informal caregiving costs and health effects would result in different cost-effectiveness conclusions, and have different implications for programs or policies that are adopted based on CUA results. As new interventions are developed for AD/dementia, it will be important to understand the economic value of these interventions, and it is important to understand whether caregiving spillover is an important component to include in CUAs. The purpose of this study was to identify family or informal caregiver spillover effects in AD/dementia CUAs and examine how the inclusion of these outcomes changed CUA results. We investigated the frequency in which spillover costs (e.g., opportunity costs of caregiving time and out-of-pocket payment for family or other caregivers such as transportation expenses) and spillover health impacts (e.g., subjective burden, health utility, and well-being of a family member/caregiver) have been incorporated into AD/dementia CUAs. Our study expanded on previous research by Krol and colleagues  by analyzing more AD/dementia CUAs and more recent studies, which allow us to evaluate trends in the inclusion of spillover effects in the literature. In addition, we examined how including spillover effects in a CUA may influence the reported value of AD/dementia care and how conclusions may change when spillover is included under various cost-effectiveness thresholds. We used the PubMed database to identify all available CUAs published between January 2000 and March 2018 that analyzed an intervention for a patient with AD or dementia, following the Preferred Reporting Items of Systematic Reviews and Meta-Analyses (PRISMA) protocol  (Fig. 1). We searched for English-language CUA articles using the following keywords: “QALYs”, “quality-adjusted”, “cost-utility analysis”, “DALY”, and “disability-adjusted”, and identified 193 publications. We screened all abstracts and full-text articles and selected publications that contained original cost per QALY or disability-adjusted life-year (DALY) estimates. We excluded reviews, editorials, and purely methodological articles, along with economic evaluations that did not use QALYs or DALYs to quantify health benefits (n = 125). Because our intent was to evaluate both cost and health-related quality of life impacts on informal caregivers, we excluded economic evaluations in the form of cost per life-year gained, or other effectiveness metrics. For the purpose of studying spillover effects on informal caregivers, we selected CUAs that evaluated interventions targeting people with AD/dementia, and excluded studies of interventions focusing solely on caregivers (n = 5). This search resulted in 63 articles that met our inclusion criteria [21, 22, 23, 24, 25, 26, 27, 28, 29, 30, 31, 32, 33, 34, 35, 36, 37, 38, 39, 40, 41, 42, 43, 44, 45, 46, 47, 48, 49, 50, 51, 52, 53, 54, 55, 56, 57, 58, 59, 60, 61, 62, 63, 64, 65, 66, 67, 68, 69, 70, 71, 72, 73, 74, 75, 76, 77, 78, 79, 80, 81, 82, 83]. As a confirmation of our PubMed search, we also searched two online repositories of English-language CUAs: the Tufts Medical Center Cost-Effectiveness Analysis Registry (http://www.cearegistry.org), which includes cost per QALY studies, and the Global Health Cost-Effectiveness Analysis Registry (http://www.ghcearegistry.org), which contains cost per DALY studies. This search produced no additional articles that met our inclusion criteria. Two independent reviewers read each of the 63 identified AD/dementia CUAs. We used a standardized data collection form to extract information on CUA methods and results, as well as caregiver spillover effects, which are summarized in Appendix 1. We examined a number of caregiver spillover variables, including the relationship of the caregiver to the patient, identification of spillover costs or health effects on caregivers or family members in the analysis, and method of incorporating those spillover effects into the results. Discrepancies between reviewers were resolved with a consensus audit. We conducted a pilot review of ten studies and modified the data collection form prior to reviewing the remaining 53 studies. We investigated the frequency in which spillover costs and health effects were considered in AD/dementia CUAs and summarized how they were incorporated into the analyses. We summarized the characteristics of AD/dementia CUAs with and without spillover costs or health effects. We also examined the impact of incorporating caregiver spillover effects into the reported ICERs. Specifically, when possible within a study, we compared each ICER that included family spillover costs or health effects with corresponding ICER that did not incorporate these spillover effects. Where those comparisons were not reported by the author but disaggregated costs and QALY values were, we re-calculated the ICER presented in the paper to allow this comparison. For example, if the study only reported the ICER with family spillover, and the information was available, we re-calculated the ICER without spillover. To derive patient-only costs, we subtracted caregiver costs from the total costs. To calculate patient-only QALYs, we subtracted caregiver QALYs from the total (caregiver plus patient) QALYs. We repeated these steps for the intervention and the comparator separately. We then divided the difference in patient-only costs by difference in patient-only QALYs associated with the intervention and the comparator to derive an ICER without spillover effects. We compared within-study ICER pairs with and without spillover. We recorded whether inclusion of spillover would increase, decrease, or produce no change in the ICER, and whether an ICER’s increase or decrease crossed commonly cited US cost-effectiveness thresholds (i.e., cost-saving; US$50,000–US$150,000/QALY, and dominated; Appendix 1). All ICERs were converted to 2017 US dollars using currency exchange rates and the consumer price index. All 63 identified AD/dementia CUA studies used QALYs and none used DALYs as health outcome measures. Of these, 46 focused on the Alzheimer’s disease type of dementia, one on Parkinson disease-related dementia, and 16 on non-specific or other types of dementia (such as vascular dementia). Almost half of the studies (n = 31) evaluated the cost effectiveness of pharmaceuticals (Table 1), with donepezil being the most commonly assessed drug (n = 11). Most AD/dementia CUAs were conducted from the societal perspective (69%), in a European country (66%), and published between 2012 and 2018 (55%). These 63 studies reported 127 ICERs (as some studies reported multiple ratios): 51 (40%) cost saving; 48 (38%) below US$150,000/QALY; and 28 (22%) over US$150,000/QALY or dominated (higher costs but less effective). Study Perspective: By definition, studies conducted from a societal perspective were more likely to include spillover effects (95%; n = 41 out of 43), compared with studies conducted from a payer perspective (17%; n = 3 out of 18). Time Trends: In 2000–5, 30% of AD/dementia CUAs included spillover effects in analyses (n = 3 out of 10). This proportion increased to 79% among studies published from 2006 to 2011 (n = 15 out of 19) and 76% in 2012-quarter 1 2018 (n = 26 out of 34). Funding Source: A higher proportion of industry-funded studies included spillover (76%; n = 16 out of 21), compared with studies funded by government or foundation sources (66%; n = 21 out of 32). Intervention Type: Among studies that evaluated health education or behavior interventions, 75% included spillover effects (n = 6 out of 8), compared with 71% among studies evaluating screening or diagnostic procedures (n = 10 out of 14) and 65% among pharmaceuticals (n = 20 out of 31). Prevention Stage: Among articles evaluating primary (e.g., immunization or health education) or secondary prevention (e.g., screening), 82% included spillover (n = 14 out of 17), compared with 65% of the studies that evaluated tertiary interventions [e.g., AD medication] (n = 30 out of 46). Country: A higher proportion of US studies considered spillover effects (90%; n = 9 out of 10), compared with studies from Europe (66%; n = 27 out of 41) or other countries (67%; n = 8 out of 12). Disease Stage Targeted: Among studies targeting individuals with mild and moderate AD/dementia only, 67% included spillover effects (n = 22 out of 33), compared with 81% among studies that also included patients in the severe disease state (n = 12 out of 15). Informal care may be provided by an unpaid family member or a non-family member (e.g., friend, neighbor). Of the 42 studies that included spillover costs, 16 (37%) explicitly stated that they measured costs incurred by family caregivers, such as a spouse or a child (Table 2). The most common analytic approach to including caregiver costs into the analysis was to add informal caregiving time costs to patient costs (n = 36). Few studies included caregiver out-of-pocket costs in the analyses (n = 3). Of the 12 studies that reported spillover health effects, nine included health utility values for the caregiver using preference-based instruments, most commonly the EQ-5D (n = 4) or SF-6D (n = 3). The other three reported summary measures of the informal caregivers’ mental health, and stress, using measures that were not converted into health utilities, such as the General Health Questionnaire (GHQ-28), the Relative’s Stress Scale, and the Zarit Caregiver Rating Scale [25, 73, 82]. Five studies (38%) explicitly stated the spillover health effects were on caregivers identified as family members. When caregiver health impacts were incorporated into the analysis, most studies added caregiver QALY losses to patient values for the denominator of the ICER (n = 7). Among the 127 reported ICERs, 33 ICERs from 19 studies (30%) were reported or could be calculated with and without spillover effects (Table 3). Characteristics of this study subset are similar to those of the total sample of studies with ICERs that included spillover effects (Appendix 2). In this subset of 33 pairs of ICERs, incorporating spillover cost and/or health effects decreased ICERs [making them more favorable] (n = 15; 45%) or kept the intervention cost saving (n = 13; 39%) in most cases. In fewer cases, including spillover increased ICERs (n = 2; 6%), kept the intervention dominated [more costs/less QALYs] (n = 2; 6%), or changed ICER from dominated to less cost/less QALYs (n = 1; 3%). In this subset of 33 ICER pairs with and without spillover effects, we also examined whether these changes in ICERs crossed a common cost-effectiveness threshold, which could lead to different cost-effectiveness implications. In 11 cases (33%), adding spillover led to a lower ICER that crossed a cost-effectiveness threshold (Table 3). In most of these cases (n = 7), the intervention cost more than the comparator without spillover, but the intervention became cost saving with the addition of spillover. In 21 cases (64%), including spillover effects did not change the ICER enough to cross a cost-effectiveness threshold. In one case, including spillover made the AD/dementia intervention less favorable, starting below the US$50,000/QALY threshold without spillover and ending up above this threshold with spillover. In our review of 63 AD or dementia CUAs, 70% of studies incorporated spillover costs related to informal care, most commonly as caregiving time costs, but considered caregiver health impacts in analyses less often. Our findings suggest an increasing recognition of spillover effects related to informal caregiving in more recent studies that evaluate the cost effectiveness of AD/dementia interventions. Among the 30% of studies reporting sufficient information to compare cost-effectiveness ratios with and without spillover, we found that in about 85% of scenarios including spillover effects in analyses led to more favorable ICERs or kept the intervention cost saving. The broader value of an AD/dementia intervention to society may in some cases be underestimated without considering the cost and health impacts on informal caregivers. Studies conducted from the societal perspective were more likely than those conducted from the payer perspective to include spillover effects, which reflects the expanded scope of these analyses. Studies published from 2006 to 2018 were more likely than those published in 2000–2005 to include spillover effects. This is consistent with an emerging international consensus on the importance of including family spillover effects in CEAs, including guidelines set forth by the Second US Panel on Cost-effectiveness in Health and Medicine . Although the majority of AD/dementia CUAs in our review targeted non-US populations, a higher proportion of US studies included spillover effects, likely because more US studies used a societal perspective (USA: 90%; Europe: 63%; other: 67%). We also found that more industry-funded studies were conducted from the societal perspective, compared with government- or foundation-funded studies (76% vs. 66%), and hence were more likely to include spillover effects. Our findings showed that spillover effects, when included in the analyses, only pertained to the primary caregiver, when in fact caregiving for someone with AD/dementia is typically a responsibility shared among several family members [4, 84]. Data from Spain, Sweden, Germany, the UK, and USA report that 46–92% of AD/dementia informal care is provided by the primary caregiver [85, 86, 87]. Future studies should measure AD/dementia spillover effects beyond the primary caregiver  and differentiate those who may experience greater cost and health impacts, such as sole caregivers compared with co-resident caregivers . We also did not find any spillover effects on non-caregiving family members who also may be affected. Both populations are important to study because the spillover effects of illness may arise through both a “caregiving effect” and a “family effect”, that is, the impact a family member’s sickness has on someone who shares an emotional bond with that ill person [16, 88, 89]. Therefore, the AD/dementia spillover effects of studies in our review may be underestimated because of these limitations. Previous research has shown that spillover can be quantified in terms of health utility for more than one family member , and this is an important future direction for AD/dementia CUAs. Most studies included caregiving time costs, with a small number stating that they valued this time as a productivity loss. Very few studies included caregiver out-of-pocket spending (such as travel expenses). In addition, our findings suggest that health-related quality-of-life spillover effects on caregivers are largely omitted in current AD/dementia CUAs. When spillover health effects were considered, most studies added caregiver QALY losses to patient values; a few studies reported caregiver’s subjective burden but did not included the outcome in ICER calculations. These omissions are particularly striking in the context of AD/dementia, which has a well-known caregiving burden [1, 2, 3, 4]. Caregivers may highly value improvements in AD/dementia therapy that can alleviate their burden, independent of improving the health of the patient . Such treatment benefits may be particularly important because caregivers are often the ones making healthcare decisions for patients with AD/dementia. These spillover cost and health effects, when relevant, should be consistently incorporated into economic evaluations to support decision making on the value of these interventions to families and society at large. In contrast to Krol et al.’s study that identified the inclusion of informal care in 64% of AD/dementia CUAs (n = 16 out of 25), 70% of studies in our review (n = 44 out of 63) included at least some spillover effects. In Krol et al.’s review, the inclusion of spillover costs and health effects had limited impact on cost-effectiveness results in most studies . However, based on more studies and more recent data, our findings suggest that inclusion of caregiver spillover effects in AD/dementia CUAs can have an impact on cost-effectiveness results. Of the 19 studies that provided sufficient information to compare cost effectiveness with and without spillover, we found that incorporating spillover effects decreased the ICERs or kept the intervention cost saving in about 85% of cases. Although this impact varied from study to study, we found that in this subset, one in three ICERs decreased to an extent that it crossed conventional CEA value thresholds, which could have downstream implications for policies adopted based on cost-effectiveness considerations. These findings emphasize the importance of including not just patient, but also caregiver outcomes in evaluating the economic value of AD/dementia care [13, 14, 15, 16]. It is important to note that these findings are based on a subset of ICERs that allowed comparisons with and without spillover, but this subset was representative of the overall group of studies incorporating spillover. Consistent with our results, previous studies across a range of disease areas have reported that including spillover most commonly makes interventions appear more cost effective [90, 92]. In our review, AD/dementia interventions tend to alleviate caregiver burden rather than increasing caregiver involvement. Some examples include reducing symptom severity of the patient and delaying progression to more advanced disease stages, both of which can decrease caregiving time [33, 36, 61]. There are methodological challenges in measuring AD/dementia spillover costs and health effects. For example, commonly used preference-based measures for assessing caregiver health utility such as the EQ-5D and SF-6D cover limited mental health domains . Therefore, these instruments may not be sensitive to the type of health concerns experienced by AD/dementia caregivers (such as stress, anxiety, and depression). In addition, as AD/dementia advances, the amount of time caregivers spend assisting patients with activities of daily living may increase and the health impact on the caregiver may intensify as a result of worsening patient symptoms [10, 94]. Previous studies in other disease areas have shown that caregiver spillover varies by patient symptom severity, and this level of detail should be incorporated into future AD/dementia CEAs . Indeed, we found that studies that included patients with AD/dementia in the severe disease state were more likely than those targeting patients with mild and moderate disease to incorporate caregiver spillover into analyses. Other spillover variation that is important to include in future studies includes changes in caregiving that occur during end-of-life care and with shifts in the patient’s care setting. Caregiver burden is likely to intensify as people with AD/dementia approach the end of life [4, 96]. Further, the burden of informal care may also be different when patients transition from home to a nursing facility where caregiving tasks typically shift from providing comprehensive care to emotional support, interacting with facility staff, and advocating for appropriate care . Future AD/dementia economic analyses should better reflect the dynamic of spillover effects in relation to disease severity, end-of-life care, and care setting. The findings from this study should be interpreted in terms of equity considerations. For instance, including family spillover may favor interventions targeted at groups that have better social support networks, or illnesses with a high family/caregiver impact (such as AD/dementia) as opposed to conditions that primarily impact the patient and not family members [13, 90]. In light of these concerns, researchers have suggested that the reference case of a CUA should present aggregated results including informal care, and explore alternative spillover outcomes on family/caregivers and valuation strategies in sensitivity analyses [90, 92, 97]. Studies should also justify why (or why not) spillover effects are incorporated into analyses. This approach would promote transparency and allow decision makers to better evaluate the trade-offs . Our data are limited by the information reported in the reviewed articles. In most cases, we were unable to determine an exact relationship between the patient and the informal caregiver unless it was clearly stated in the article. Only a subset of studies provided sufficient information for comparing the ICERs with and without spillover. The variation in the type (e.g., caregiving time, out-of-pocket costs) and the corresponding magnitude of spillover estimates included across studies also made it impossible for us to determine characteristics of studies (intervention type, funding source) where spillover was particularly important to include. Measuring the costs and health impacts related to caregiving spillover is often a time intensive process that would best be targeted to situations in which spillover is an important component to understanding the true value of an intervention. We also did not find any indication that the authors included positive spillover effects possibly related to caregivers’ finding fulfillment and purpose in their responsibilities . 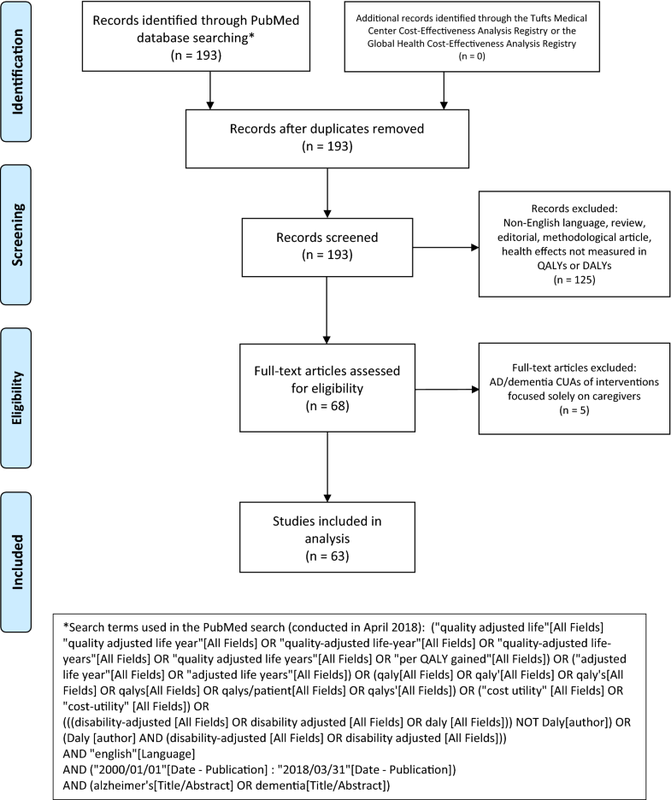 Finally, the majority of AD/dementia CUAs in our review reported cost savings or an ICER below US$150,000/QALY, which may reflect potential publication bias (in which studies with favorable ICERs are published more often than studies with less favorable ICERs) that is found in the general CUA literature . Our results suggest that current economic analyses that aim to measure the cost effectiveness of AD/dementia care largely ignore how the intervention may affect caregiver health-related quality of life, although most studies incorporate some components of informal care costs. When they are included, AD/dementia spillover costs and health effects tend to lead to more favorable cost-effectiveness estimates or keep the intervention cost saving. These findings indicate that the broader value of an AD/dementia intervention to society may in some cases be underestimated without considering caregiver cost and health outcomes. This study was supported by research funding from Otsuka Pharmaceutical Development & Commercialization, Inc. to Tufts Medical Center. Pei-Jung Lin has served as a consultant for Avanir, Otsuka, and Takeda outside the submitted work. Peter Neumann reports honorarium income from Merck, Bayer, Pacira, Novo Nordisk, Shire, and Amgen, other income from the Congressional Budget Office, Boston Health Economics, Vertex, and Precision Health Economics, and funding support from CEA Registry sponsors outside the submitted work. Myrlene Sanon Aigbogun and Dorothee Oberdhan are employees of Otsuka Pharmaceutical Development & Commercialization, Inc., which provided funding for this research. Tara Lavelle has received consulting fees from Takeda Pharmaceuticals for advice on a cost-effectiveness analysis for Alzheimer’s disease. Brittany D’Cruz and Ashley A. Leech have no conflicts of interest that are directly relevant to the content of this article. P-J L, BD’C, PJN, MSA, DO, and TAL provided the study concept and design. P-JL, BD’C, AAL, and TAL were involved in the data acquisition. P-JL, BD’C, AAL, MSA, and TAL drafted the manuscript. All authors participated in the analysis or interpretation of data as well as the preparation and critical revision of the manuscript. National Alliance for Caregiving in Partnership with the Alzheimer’s Association. Dementia caregiving in the U.S. Bethesda, MD. 2017. http://www.caregiving.org/wp-content/uploads/2014/01/Dementia-Caregiving-in-the-US_February-2017.pdf. Accessed 3 Mar 2019. Kasuya M, Meguro K. Health economic effect of donepezil treatment for CDR 0.5 converters to Alzheimer’s disease as shown by the Markov model. Arch Gerontol Geriatr. 2010;50(3):295–9. https://doi.org/10.1016/j.archger.2009.04.014. Brown H, D’Amico F, Knapp M, Orrell M, Rehill A, Vale L, et al. A cost effectiveness analysis of maintenance cognitive stimulation therapy (MCST) for people with dementia: examining the influence of cognitive ability and living arrangements. Aging Ment Health. 2018:1–6. https://doi.org/10.1080/13607863.2018.1442410. Brazier J, Connell J, Papaioannou D, Mukuria C, Mulhern B, Peasgood T, et al. A systematic review, psychometric analysis and qualitative assessment of generic preference-based measures of health in mental health populations and the estimation of mapping functions from widely used specific measures. Health Technol Assess. 2014;18(34):vii–viii, xiii–xxv, 1–188. https://doi.org/10.3310/hta18340.